Juana R. asks: Why do judges wear robes? Is this still a requirement or just a tradition? Most of us in the western world expect judges to wear a robe when they sit behind their bench in a courtroom, and they usually do not disappoint. But we rarely think about how the long, usually black, robe became the standard outfit for the men and women who preside over criminal and civil cases in the courtroom. The tradition began about seven hundred years ago in England. Robes became the standard uniform for judges in England during the reign of Edward II, who ruled from 1327 until 1377. At this point, they had already been the standard garb for academics for over a century (see: Why Graduates Wear Caps and Gowns), as well as worn in other settings. For instance, at this point, this type of garb would also have been appropriate for wear for a visit to the royal court, so a judge wearing his robes outside of the courtroom would not have been out of place. The standard robes for judges at this point came in three colors: violet for the summer, green for the winter, and scarlet for special occasions. Judges often received the material for these robes as part of a grant from the King. The last mention of the green robes occurs in 1534, and new guidelines dictating which robes could be worn at certain times appear in 1635. The new guide suggested judges wear black robes with a fur trim during the winter and violet or scarlet robes that feature pink taffeta for the summer. Historians believe that the transition to only black robes may have begun in the second half of the 17th century in England. But it is not known for sure what exactly caused the switch, though a popular theory ties the black robes to the mourning period after the death of a monarch. Some historians claim that the funeral of Queen Mary in 1694 helped cement the already worn black robes as the typical attire while others point to the death of Charles II in 1685 as the start of that tradition. Whatever the case, additional guidelines instructing judges to wear black robes appeared in the middle of the 18th century. At that point, English judges typically wore a scarlet robe with a black scarf and a scarlet hood when presiding over criminal cases. But for civil cases, they often wore black silk robes. When the judges in the American colonies presided over legal proceedings, whether civil or criminal cases, they carried over the English tradition of wearing robes. This topic produced debate between Thomas Jefferson and John Adams after the colonists won the American Revolution and formed their own government. Jefferson argued that American judges should distance themselves from the traditions set down by the English and wear only a suit in court. Adams, a lawyer, disagreed and wanted judges to continue wearing the robes and wigs of English judges. A compromise ensued, with it being decided that the new American judges should wear the robe and not the wig. That is not to say that judges always wear their robes or stick to the traditional black robe. Judge ShawnDya L. Simpson of Manhattan, New York has admitted to forgoing the robe altogether in favor of a lime green suit on occasion. Even when she wears her robe, she does not always fasten all the buttons on it. She also occasionally accents her robe by wearing a scarf or a necklace. Justice Bruce Allen of the New York State Supreme Court usually leaves off his robe while sitting at the bench. He generally only wears it when there is a jury present in the courtroom. If you’re curious, beneath their robe, judges most often wear formal clothes such as button-up shirts with neckties, blouses, and slacks. That said, it is not totally unheard of for them to wear less formal clothing, such as golf shirts, underneath their robes in the warmer summer months. The first robes worn by the U.S. Supreme Court in 1792, called the “robes of justice”, were black with red and white trim on both the front and the sleeves. Vail Daily column: Why do judges wear robes? 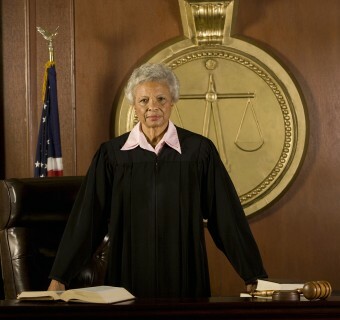 Why do judges wear a black robe? What Do Judges Wear Under Their Robes? Should be Edward III (Reign 25 January 1327–21 June 1377).